It has just been announced that Bank of Ireland and Danske Bank will introduce polymer notes in Northern Ireland in the near future. Bank of Ireland plan to issue £5 and £10 notes in 2019 and a £20 note in 2020 while Danske Bank will issue a £10 note in 2019. Specimen images of the Bank of Ireland £5 and Danske £10 notes are attached. I was expecting them to change at some point in time. That basically leaves First Trust as the odd one out with a Banknote design thats essentially unchanged since 1979. 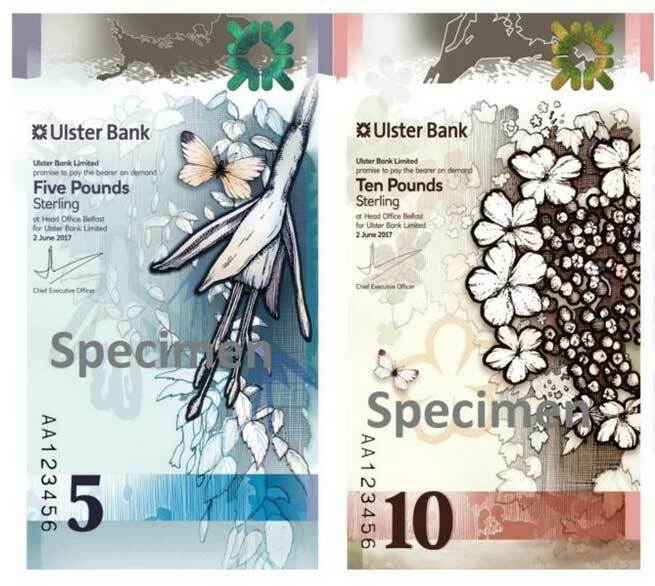 Here is an image of the new Ulster Bank polymer notes. I like the design of those Ulster Bank notes and in vertical format too. It will be interesting to see if the First Trust Bank follows the trend. I just spotted an image of the new Bank of Ireland £10 to add to the line up. Here are images of the reverse of the Bank of Ireland £5 and the Danske £10 polymer notes. Both banks have essentially retained the reverse design in use on their current issues. Today was a significant one for banknote issue in Northern Ireland, with 5 note designs issued by three different banks. The Ulster Bank and Bank of Ireland issued £5 and £10 notes while Danske issued a £10 note. Need pictures of the new notes. Scans of the 5 new note designs in specimen form are shown in earlier postings. Interesting to see that the signature on the new issued Ulster Bank £5 and £10 notes differs from the original specimens dated 2nd June 2017 which were signed by J.Brown. The new notes dated 12th April 2018, have the signature of Ross McEwan. Images of the £10 front and back are attached. Oh my - they've resurrected the Ploughman! Yes, a blast from the past, 1929 revisited ! The final design differs in a number of subtle ways from the original specimen. Replacement notes, prefix ZZ, have been observed for the Bank of Ireland £5 and £10 notes. Here is a replacement £5 note. I would guess that the prefix continues from the previous series. ... and here's a £10 replacement note with ZZ prefix. It is interesting that both notes bear a date back in 2017, nearly two years prior to their issue. Just spotted a Danske Bank £10 replacement polymer note, image attached. Interesting to see that the prefix is ZZ rather than YY used in the previous series. It is now more than a month since the launch of the new polymer notes in Northern Ireland. It is curious that replacement notes have been seen for the Bank of Ireland £5 and £10 notes and the Danske Bank £10 but not for the Ulster Bank £5 or £10 ? Perhaps the printing of the Ulster notes went exceptionally well! Or maybe they might have sropped using a marked replacement note system.